This post is a part of our Social Media 101 series. You can view the introductory post here. Facebook is by far the biggest and most used social media platform. Put simply, Facebook is a platform where you can converse with your friends or customers both privately and publicly using photos, videos and messages. If you are looking to use Facebook for your business, you will need to sign up for a personal profile. You can do that by following the prompts on the Facebook homepage. 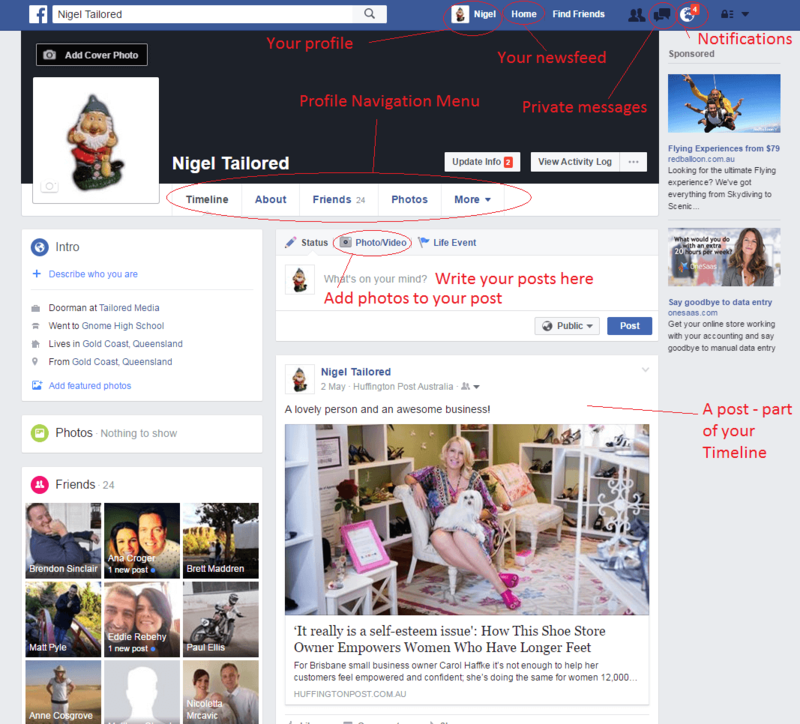 It is not possible to set up a business page on Facebook without a personal profile. 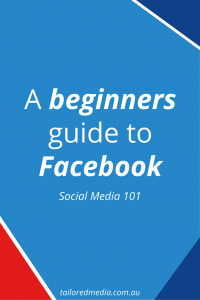 What do I need to know before getting started on Facebook? Your home page is also referred to as your news feed. It is a list of posts from people and pages you follow. When you log in to Facebook, this is the first page you will see. Your profile page is where everything you post or share with your friends is kept in one convenient place. You can find your profile by clicking your name in the top, blue menu bar. The tabs under your name are the main navigation buttons for personal profiles and are very similar to the tabs on a business page. A chronological list of everything you have posted. A sub-page that stores the personal information you have entered about where you have studied, where you were born, your relationship status, your contact details and pages you have liked, etc. A list of the people you have accepted as “friends”. These are the people who can see your profile and what you post. A compilation of all of the photos you have posted. These can be sorted into albums. A list that allows you to access information about the pages you have liked, groups you are a part of and videos you have posted. This is where you post to Facebook. This is located at the top of the page on both your Profile Page and Home Page. From here you can update your status (ie. let your friends know about the funny thing your kid did), post a photo or video (of your cat in an awkward situation), or create a Photo Album (of all the photos you took on your holiday to Bali). Even though these posts typically can only be seen by your friends, do not post anything on here you wouldn’t want your clients (or grandmother) to see. Anything you post on the internet is there forever and there is a high possibility one of your clients will see it. This is NOT where you post for your business. Your privacy settings are probably too high. This means that the people you want to see your posts won’t actually see anything, making your posts worthless. You are probably also sharing personal information about your life which you should not be sharing with your customers or clients. Provided your privacy settings are correct, people will need to be your “friend” to see the things you post on your profile. This means they need to send you a friend request and you need to accept it. How do you send a friend request? To send someone a friend request, search for their profile using the search bar at the top of the page. Once you are friends with each other, you are able to “like”, comment and share each others’ posts. How do you make sure only your friends see your posts? It’s a good idea to regularly check your privacy settings on your personal profile. As Facebook introduces new features, you will need to let them know who you would like to see your content. To update your privacy settings, click on the downward arrow in the top right hand corner of the page and select settings from the bottom of the menu. 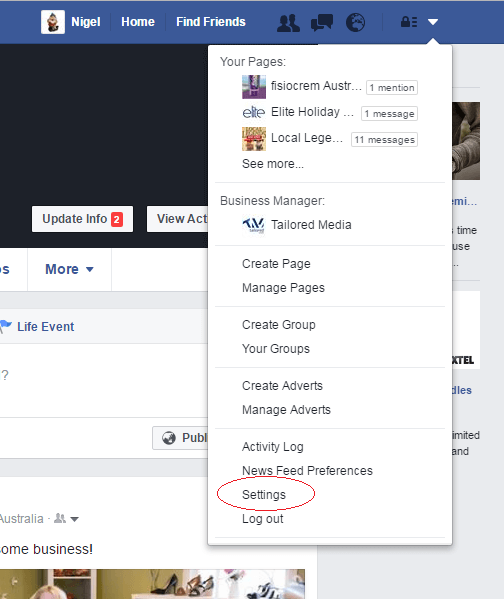 This is also where you will have the option to log out and choose your business page once you have set it up. You can see here that Nigel Tailored (our doorman) doesn’t have his privacy settings very high which means that anyone can see what he posts! Not great if he’s trying to keep his personal life separate from his business. We’d hate for Nigel’s gnoming about to affect how people perceive Tailored Media! What on earth is a “like”? A “like” is basically you giving someone a virtual thumbs up, or acknowledging that you have seen their post. To “like” something, you just need to click the little thumbs up button on a post you have found in your news feed. A reaction is similar to a like, however, it allows you to more accurately express your feelings about a post. To choose a reaction, all you need to do is hover over the like button (or press and hold on a mobile device) and choose from the pop up menu. When you share a post, it will repost it onto your own timeline so that your friends can see it. This is where you keep up to date with what has happened on your profile since you last logged in. On the left is friend requests. Here you can approve or decline the requests people have made to be your friend. Do not accept requests from people you don’t know personally. The middle icon is your private messages inbox. From there you can send messages to people privately without the whole world seeing. Planning to meet up for lunch with an old school friend? This is where you talk to them about it, not on their profile. The right hand icon is the notifications icon. If someone comments, likes or shares one of your posts, you’ll find out about it here. 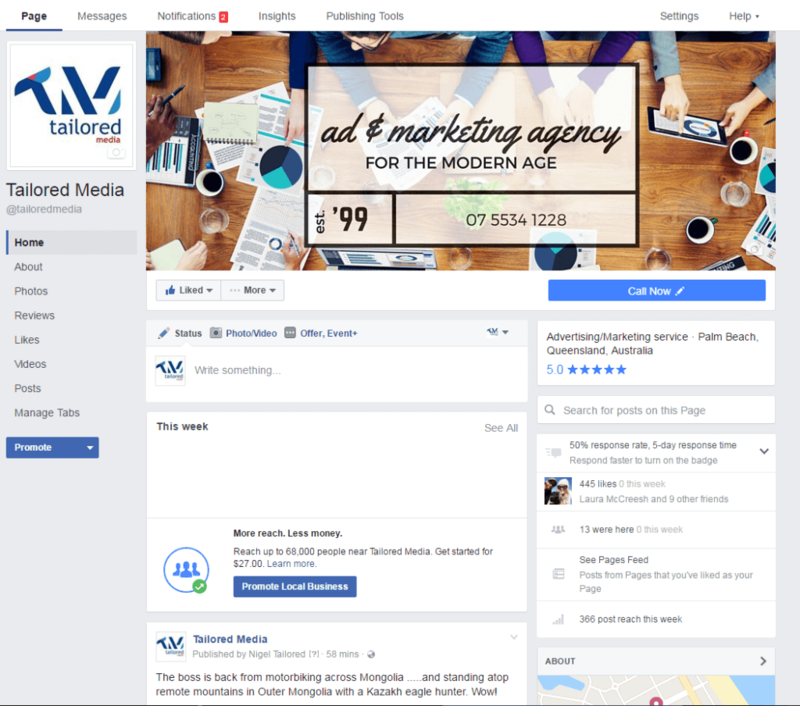 For most businesses, having a Facebook page can be beneficial purely because of the sheer number of users – there are over 1.5 billion users and over 1 billion will log in at least once daily. You also have the option to create extremely targeted advertising campaigns with relatively small budgets. 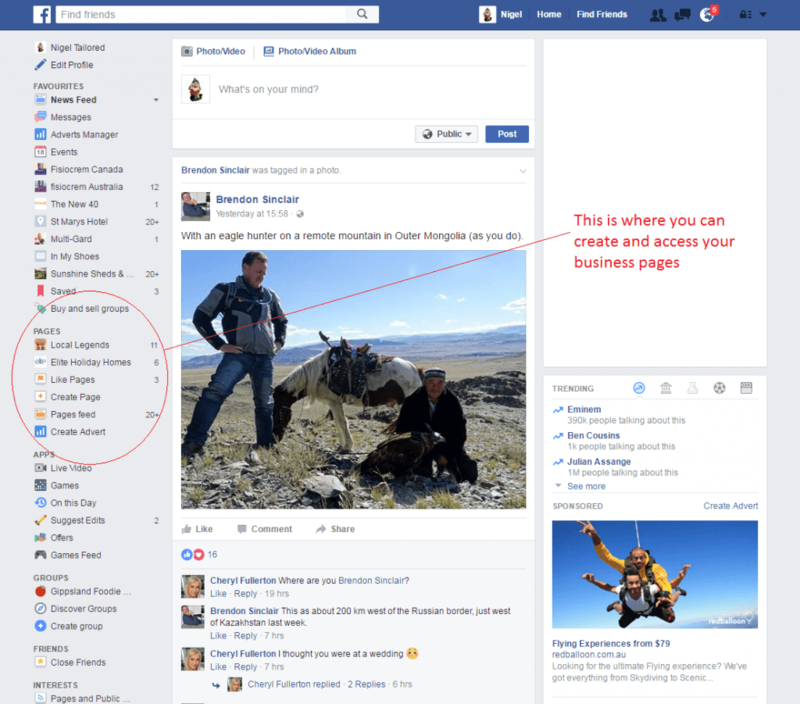 When you are using Facebook for business, you will need to set up a “Page”. You need to have a personal profile in order to set up a page. Your business pages can be set up and accessed from your home page after you log in with your personal profile. Unlike a Facebook profile, a Facebook page is completely public – anyone can see it. Another key difference is that instead of having “friends”, you have “fans”. These are people who have “liked” your Facebook Page so that they can see your posts in their personal news feed. 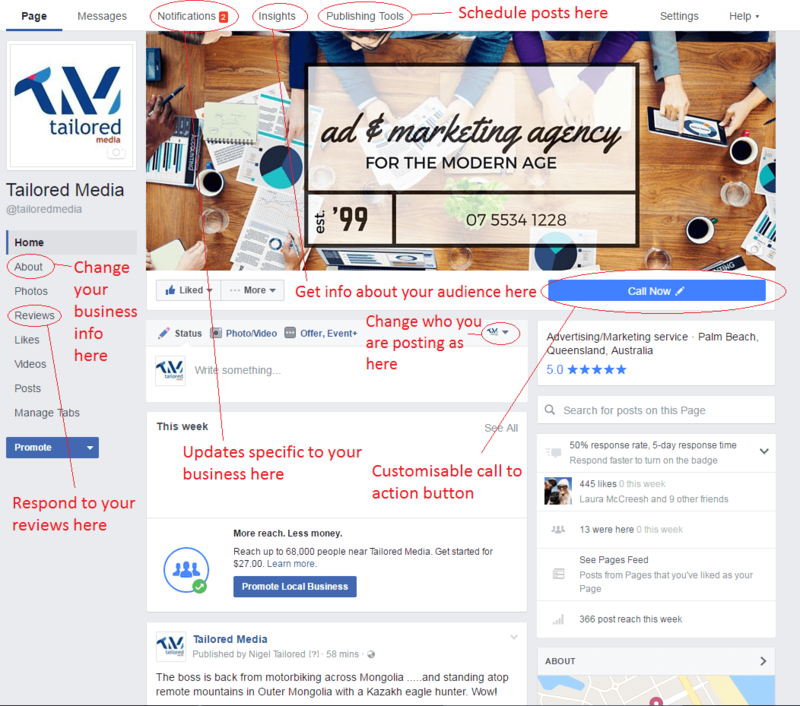 A Facebook page is also able to “boost” posts or create ads so that you can get your content in front of more people. This is your business page. Where you post to your page, and edit your business information. Where messages that have been sent privately to your business can be read and replied to. A list of all of the likes, comments, and other interactions your business page has received. This allows you to keep track of what is happening across your page so that you can respond appropriately. 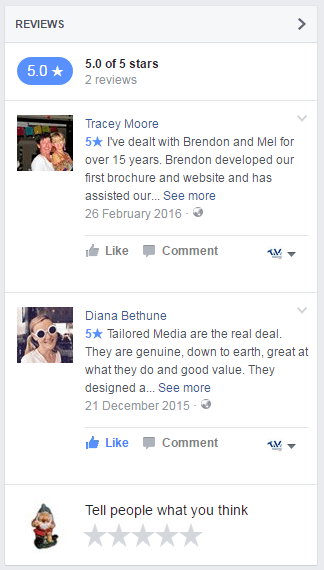 Using a Facebook business page allows you to get valuable information about how your posts are going. Some of these include data about when is the best time to post, how many views your page has had and which posts have been the most popular. Insights will also give you information about the demographics of your fans which can be extremely useful when creating engaging content. Allows you to schedule, backdate and draft posts. Lets you manage information about your business, who manages your page and how you allow visitors to your page interact with your content. Takes you to the Facebook Help Centre where you can search for your issue, post questions and email Facebook directly. Another noticeable difference between a Facebook profile and page is the “Reviews” tab under the name of your business. This is a place where customers can leave reviews of their experience with your business and you are able to respond. This is how you know you are posting to your business page. When you are on your business page, before you post something, double check which account you are posting as. You can change this using the little drop down arrow in the top right hand corner of the post box. You can then post messages and photos as you would on your personal profile. Make sure you are acting as your business page when you are responding to comments as well. 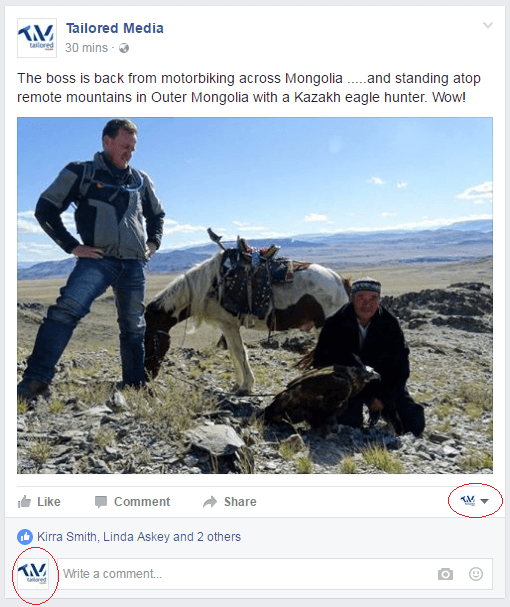 What do I post to my Facebook business page? Remember that posting to Facebook, like all other social media platforms, does not usually generate direct sales – it provides the social proof your potential customers need in order to follow through with a sale. Keeping this in mind, you should share quality information that positions you as an expert in your industry. The most effective way to post to your business page is to develop a strategy and have a think about your brand voice. What we have covered today is only the tip of the iceberg when it comes to Facebook, let alone social media.